Your order will ship TOMORROW if placed in the next 10 hours 59 minutes . Enter your shipping address zip code to receive an instant delivery date estimate from UPS. Hornady American Whitetail 30-06 Springfield Ammo 150 Grain Interlock Spire Point Boat Tail Ammo review offers the following information; Opening day of deer season comes only once a year, so make sure you're ready and load-up with this Hornady American Whitetail 308 Winchester ammunition! Hornady designed and tailored the American Whitetail line of ammunition just for the Whitetail Deer hunter. Hornady has combined a generation of ballistic know-how and combined that knowledge with modern components and manufacturing excellence to create a line of ammunition that will deliver the consistent accuracy and performance that they have built their reputation upon. This Hornady American Whitetail 30-06 Springfield ammunition is loaded with a 150 grain Interlock Spire Point Boat Tail bullet. The Hornady InterLock bullet is designed to be a devastating hunting bullet and nothing less. The InterLock ring ensures that the hard-alloyed lead core and tapered jacket remain locked together during expansion. The resulting bullet retains more mass, energy, and momentum after impact and transfers that energy into the target. It is this reliable stopping power that has earned the InterLock a worldwide reputation as a bullet for the serious hunter. Hornady was the leading founder of the Hunting and Shooting Sports Heritage Fund, and we support or serve on The National Shooting Sports Foundation, Honored American Veterans Afield, the Sporting Arms and Ammunition Manufacturers Institute, The National Rifle Association, and many others. Hornady American Whitetail is non-corrosive, new production ammunition in boxer primer and reloadable brass cases. Hornady 30-06 Springfield ammo is packaged in boxes of 20 rounds or cases of 200 rounds. 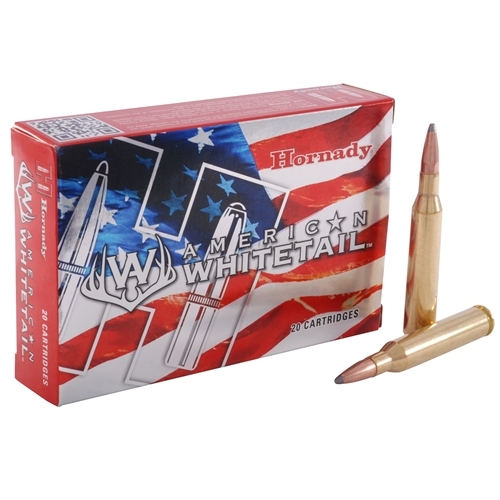 Purchase a case of Hornady American Whitetail 30-06 Springfield bulk ammo from Target Sports USA and receive free shipping!